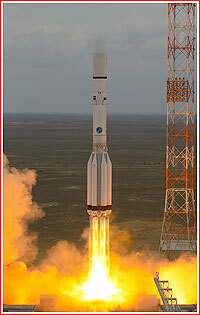 Russia's workhorse rocket launched Europe's only second mission to Mars on March 14, at the beginning of an 11-day window. It became the humanity's 45th attempt to visit the Red Planet. 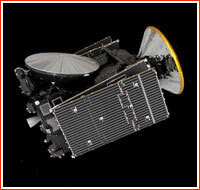 For Russian scientists, the launch marked the resumption of a cooperative effort with Europe to explore the Solar System, after the failure of the Phobos-Grunt mission in 2011. 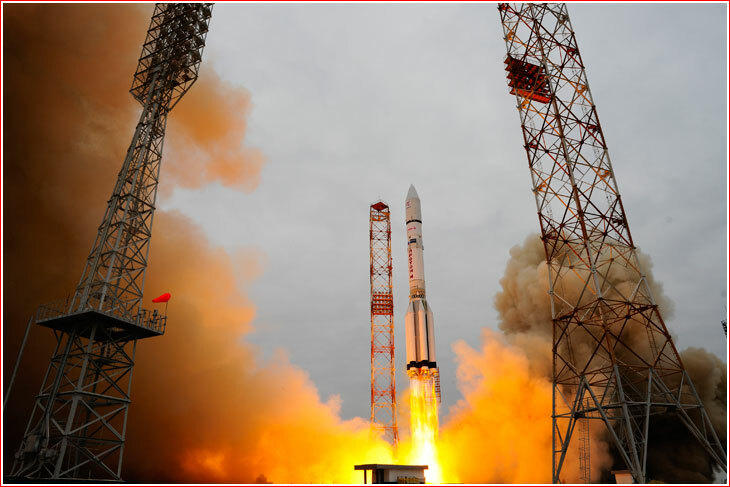 The launch of the ExoMars-2016 spacecraft was Proton's first "interplanetary" assignment in almost two decades. 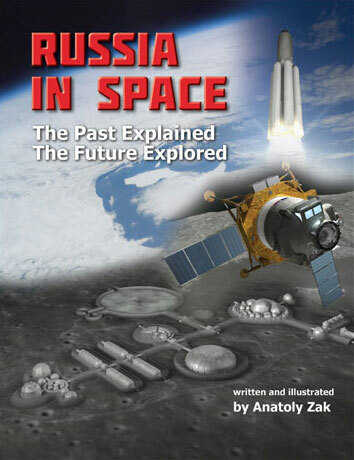 During its previous attempt in November 1996, Proton's upper stage failed, sending the precious Mars-96 spacecraft to a fiery desmise in the Earth's atmosphere and effectively stalling Russia's planetary exploration program for a generation. For the latest mission, the Proton-M variant was equipped with the Briz-M upper stage, which has never been used for deep-space launches. Although the first 10 minutes of the ascent into space were largely routine, Briz-M's task to send the probe from Earth's parking orbit to its escape trajectory toward Mars was significantly different from the space tug's typical mission to place satellites into the geostationary orbit. Like on Briz-M's most trips, the final push to leave the initial parking orbit around the Earth had to be split into multiple firings due to the low thrust of the space tug's main engine. As a result, the stage had to make two progressively stretched loops around the Earth, before the fourth firing enabled the mission to finally break the chains of the Earth's gravity and begin its trek to Mars some 10.5 hours after liftoff, or around an hour later than on routine commercial missions. Although widely practiced in space flight, such a multi-maneuver scenario had its drawbacks. The more firings the space tug makes, the more navigational errors might affect its final flight path. In addition, the extra time needed for maneuvers increases chances for potential problems to spring up such as overheating and leaks. Fortunately, Briz-M had consistently shown improving performance during the latest Proton missions in 2015 and 2016. The launch window for the ExoMars mission remained open from March 14 until March 25, 2016, however the exact launch time would be drifting back slightly every day the launch would be delayed. The duration of the escape maneuvers from the Earth's orbit also had minor fluctuations within the window. Finally, lighting conditions for the spacecraft in orbit varied slightly as well. Illumination by the Sun was critically important for the power balance onboard ExoMars, which depended entirely on solar panels. The launch scenario for the ExoMars-2016 mission. On March 14, 2016, at 02:01 GMT (10:01 p.m. EDT on March 13) engineers in Baikonur began the final countdown to the launch of ExoMars-2016, then seven hours 30 minutes away. Simultaneously, ground stations involved into the mission were scheduled to conduct readiness test for communications with the probe. Finally, hourly "go/no go" checks on the spacecraft also commenced. 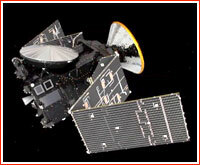 Shortly thereafter, the European Space Operations Center, ESOC, confirmed that it had been receiving telemetry from ExoMars. The delicate three-hour process of fueling of the Proton rocket with its highly toxic propellants began as scheduled at 03:31 GMT on March 14 (11:31 p.m. EDT on March 13) exactly six hours before the scheduled liftoff, following a formal approval from the Russian State Commission overseeing the launch procedures in Baikonur. ESA reported that weather conditions had been deemed acceptable for the liftoff despite cloudy skies and some possibility of rain. At 07:40 GMT, one hour 50 minutes before launch, special Thermal Control System, which supplied payload with air on the launch pad, was turned off and launch personnel began undocking air hoses connected to the payload section of the Proton rocket. The service gantry surrounding the vehicle began rolling away to its safe parking position from the pad around 08:15 GMT, or six minutes ahead of schedule. 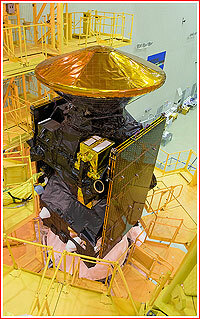 At 09:11 GMT, just 20 minutes before a scheduled liftoff, ExoMars-2016 was switched to internal power. 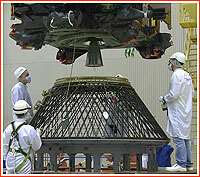 The final checks on the spacecraft were conducted as late as 10 minutes before liftoff. 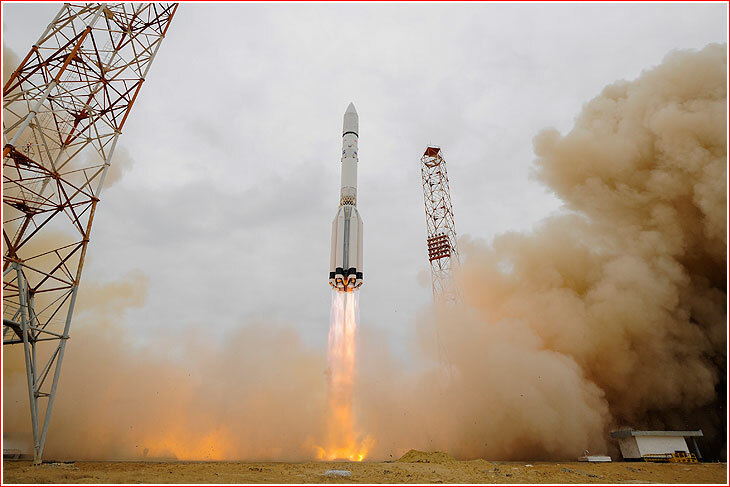 The liftoff of the Proton-M rocket with a Briz-M upper stage took place as scheduled on March 14, 2016, at 12:31:42 Moscow Time (09:31 GMT, 5:31 a.m. EDT) from Pad 39 at Site 200 in Baikonur Cosmodrome. The launch vehicle carried the Trace Gas Orbiter, TGO, and the Schiaparelli lander for the ExoMars-2016 project. 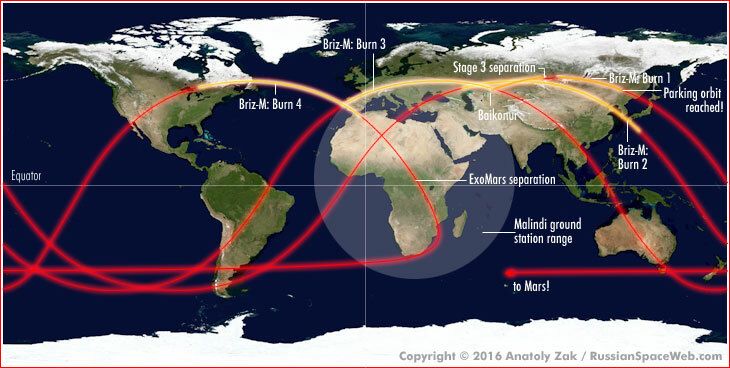 During the initial phase of the powered flight, the three booster stages of the Proton rocket followed a standard flight path to match an orbit with an inclination 51.55 degrees toward the Equator. The first stage propelled by six engines separated around two minutes into the flight, followed by the second stage five and a half minutes after launch. The payload fairing split in two halves and dropped off five minutes 45 seconds into the flight, during the operation of the third stage. Nine minutes 42 seconds after launch, the Briz-M upper stage with the TGO/Schiaparelli combo separated from the third stage of the launch vehicle, still flying on a ballistic suborbital trajectory. 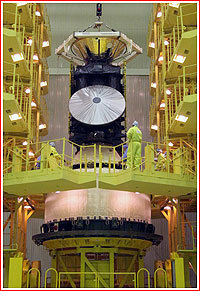 One minute 34-seconds after separation, Briz-M fired its engine for the first time over Siberia. 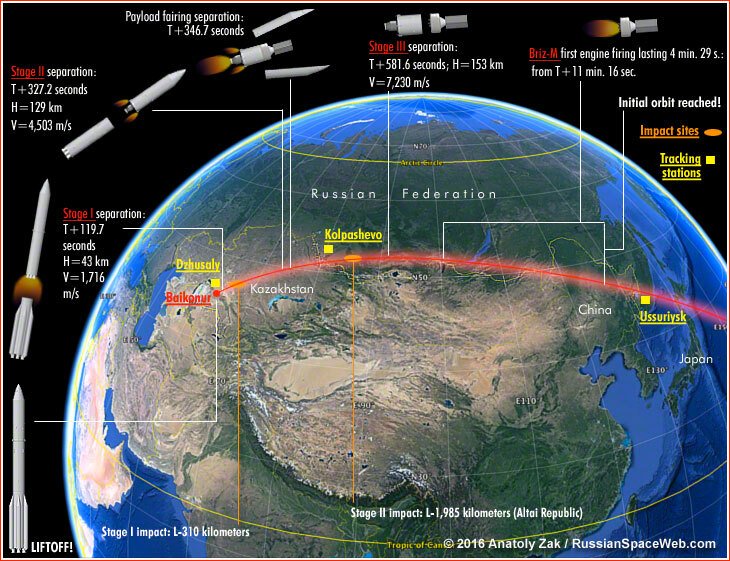 The maneuver lasting nearly four and a half minutes inserted the stack into a 175-kilometer parking orbit and was confirmed as successful by Russian and European officials. The spacecraft then flew passively for one hour 18 minutes, almost completing a revolution around the Earth before restarting its engine over Southern Russia. The maneuver extending over most of Asia pushed the spacecraft into an intermediate elliptical (egg-shaped) orbit. The spacecraft passed an apogee (highest point) over the Pacific Ocean around three hours after launch and then began accelerating back toward its home planet for another hour. Around four hours into the flight, as the vehicle crossed the coast of Portugal, Briz-M initiated its third firing. This time, the maneuver sent the stack into the so-called transfer orbit. Shortly after completing the third firing, Briz-M jettisoned its doughnut-shaped external tank, which was likely detected by NORAD radar in a 697 by 21,086-kilometer orbit. To reach its new, much higher apogee, Briz-M with ExoMars had to coast passively for nearly three hours until the Earth's gravity pulled it back yet again. Finally, at 19:47 GMT, or more than 10 hours after leaving Baikonur, Briz-M initiated its fourth and final engine firing to break itself from the Earth's gravitational field and enter a Mars-bound trajectory. The maneuver was taking place, while the spacecraft was overflying the Great Lakes, Eastern Canada and the Atlantic Ocean. Because the manuever was conducted beyond the view of Russian ground stations, its confirmation came only around 20:02 GMT. Less than 14 minutes later, at 20:12:45 GMT, the TGO/Schiaparelli stack separated from the Briz-M upper stage more than 5,000 kilometers away from Earth over Central Africa. The nearly empty upper stage was then programmed to perform two braking maneuvers to make sure it never crosses path with its former passengers. The first firing was to last 12 seconds and another would be around 1.5 minutes long until the engine run out of propellant. It was expected to happen around 23:39:52 Moscow Time (20:39 GMT). Initially, ground control believed that Briz-M behaved as prescribed after the separation. In the meantime, the TGO spacecraft attained a stable orientation relative to the Sun and began the deployment of its two solar panels. The deployment of the high-gain antenna was also scheduled within first 24 hours after launch, however its use was not expected until more than two weeks after launch. According to ESA, the 4.3-ton TGO/Schiaparelli stack was the heaviest spacecraft launched on a path to Mars, however the claim probably counted only successful missions. The ill-fated Mars-96 and Phobos-Grunt probes, which never left the Earth's orbit, had a mass of 6.8 and 13.5 tons respectively. Ground track during the launch of the ExoMars-2016 mission on March 14, 2016. Passive phases of the mission are shown in red and powered flight is marked with yellow. 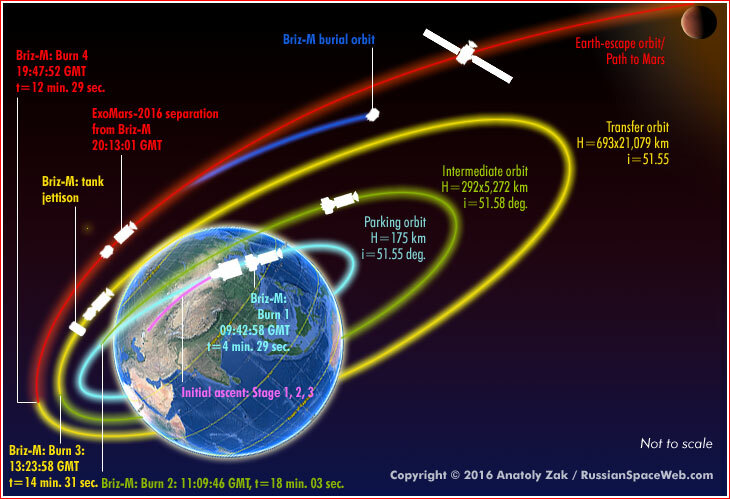 Moving eastward, the spacecraft will make three progressively higher orbits around the Earth pushed by four firings of the Briz-M space tug at perigee (lowest points of the orbit). As the spacecraft enters its Mars-bound trajectory over Africa after the fourth maneuver and begins its movement away from Earth, rather than around it, the planet's eastward rotation will cause the reversal of the probe's ground track over the Southern Hemisphere. 119.7 seconds / ~ 2 min. 327.2 seconds / 5 min. 27 sec. 346.7 sec. / 5 min. 46 sec. 581.6 sec. / 9 min. 41 sec.